On this page, you’ll find files related to the Foundation Online training course. This includes links to downloadable PowerPoint slides, and a full video of each module. The following Quick Revision Video may be handy when studying. It doesn’t cover the entire syllabus, just some of the more tricky areas. It was put together for those looking for a single video that covers some of the more tricky areas of the syllabus, in a fairly short package. Hopefully, you’ll find it useful. The can be downloaded as an mp4 video and also as an mp3 audio file – handy for your smartphone or tablet. 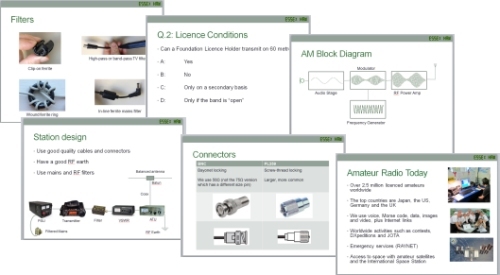 See our Ham Radio Quick Revision Page for the download links. Glad it was useful, and thanks for the feedback! Thanks to Pete and everyone else involved (although I believe Pete bears the weight of it pretty much by himself?). I suppose a 1/3~1/4 of the way through the July 2018 course and finding it very helpful indeed!, along with my Foundation Now book which is always in my hands at the moment, this online foundation course is available via a web browser or a mobile app which means course material is available anytime and anywhere mobile phone signal permitting of course! This course has been fantastic leaving my local club tutor free to concentrate on the practical side of the exam. As a result I am able to sit the exam far sooner than having to do the theory and practical at the same time. I now have only 2 practical test using an HF transceiver, which is schedualled soon. Thanks I sing you praises often. Hmm. Thanks for providing a much-needed *free* resource. But as nasty Microsoft has now removed their free PPT viewer (presumably in an attempt to force people to use/buy their products more), and the conversion service at : https://www.online-convert.com/ produces OpenOffice documents that have errors in them from your ppsx documents, would it be possible to convert all your presentation materials to a *free* format that all can use ? Such as OpenOffice ? Without incurring the sorts of problems that using Microsoft-only formats always causes ? If your club’s interested in using our slide set, we can look at converting these to a format suitable for you. Please get in touch via “Contact us”, and we’ll send over a converted version for you to test.